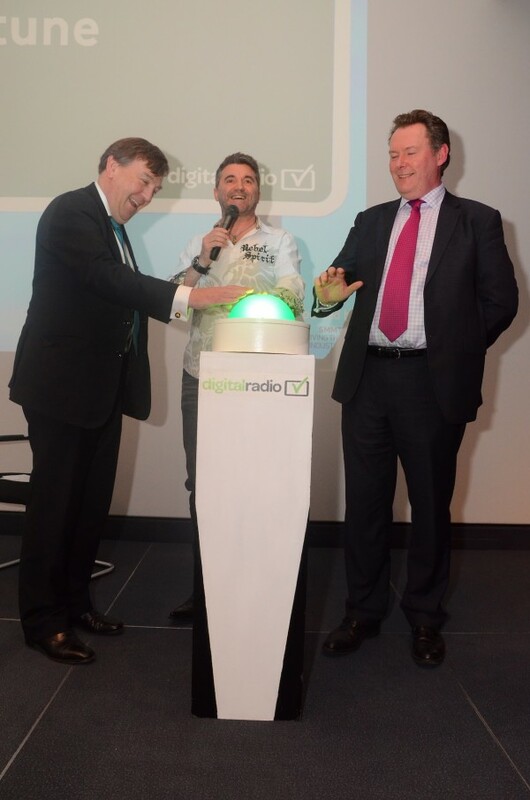 The Secretary of State for Culture Media and Sport, Rt Hon John Whittingdale MP, has officially launched the UK’s second national DAB digital radio multiplex. He was joined at the Drive to Digital event alongside Steve Holebrook, Managing Director of Arqiva Terrestrial Broadcast and Chairman of Sound Digital. 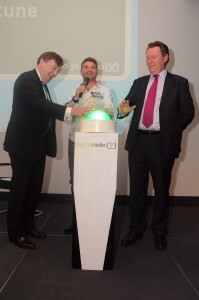 Mr Whittingdale also launched a national retune campaign, pressing Digital Radio UK’s big green retune button and urging listeners to retune their digital radios to take full advantage of the range of services now available. The new network from Sound Digital, a joint venture company formed by Arqiva, Bauer Media and Wireless Group, will feature 18 digital radio stations, with 11 now on -air and the remaining seven launching by the end of March. In conversation with Planet Rock Breakfast presenter, Paul Anthony, the Secretary of State welcomed the expansion of choice and coverage, emphasising the significance of this launch for the radio industry. The MP confirmed he was a fan of rock music – something Paul Anthony called him a rock God for – but also mentioned he didn’t yet have DAB in his car. In further content news, the conference heard about new station Heart extra from Global, a national brand extension of Heart, which launched this week on the Digital One DAB network, whilst the BBC confirmed the launch of BBC 2 Radio Country, a four-day national digital radio pop-up station running from 10 -13 March to coincide with the C2C Festival. The 18 digital stations which will be launching on the new national DAB network by the end of March represent the UK’s biggest ever expansion of national radio choice. The stations include the return of Virgin Radio; new music station Mellow Magic; new sports station talkSPORT 2; new talk station talkRADIO; business station Share Radio, and the launch of the UK’s first DAB+ services, Fun Kids, JazzFM and Magic Chilled; as well as the national expansion of existing regional stations, Kisstory and Heat. Digital Radio UK today also announced details of a consumer communications campaign encouraging listeners to retune their radios that will run across commercial radio throughout March, and further supported by the BBC. To ensure they can receive the new stations listeners should retune their digital radios by pressing the retune or rescan buttons. The Secretary of State hailed the transformation of the coverage of national and local DAB stations. He welcomed the expansion of BBC national DAB to 360 sites providing coverage to nearly 97% of the population and the expansion of local DAB coverage, which has been backed by Government and supported by industry, taking coverage of local stations from 75% to 91% by the end of Q3 2016. The combined DAB coverage expansions will bring over 10 million people and 10,000 kilometres of roads into coverage by the end of the year. By the end of 2016 the DAB coverage criteria set by Government will have been met. The DCMS plans to review a decision about digital switchover when the share of digital listening, which is currently at 42%, has grown to 50%.